I believe with all my heart that I am a happy person. I wear a smile every day--it has become my signature. Even when I was overweight, I had a great life. I got married and had two wonderful children. I never really thought that the weight affected my 25 years of marriage, but 4 months after I had surgery my husband decided he needed an out. I guess my weight was a problem and I didn't even know. Barix Clinics has been a big part of the positive changes in my life. 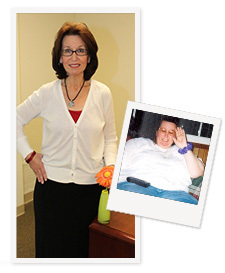 The surgery gave me the answer to the dream I had every night, to lose weight. They took great care of me and they still do. The experience overall was one I will remember forever; how can I not? My surgeon took the time to explain everything, the nurses answered my questions and the nutritionists still help keep me on track.